Hello Doodlebug friends. Are you ready for Christmas? 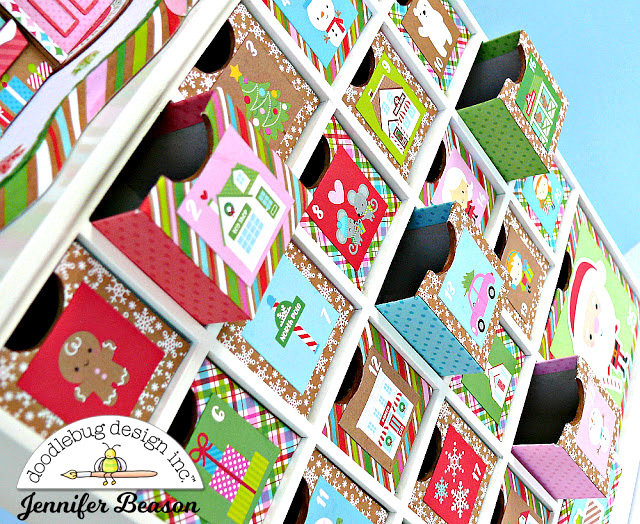 Well, today I have an advent calendar to share that will hopefully make the wait to the big day a bit more fun. 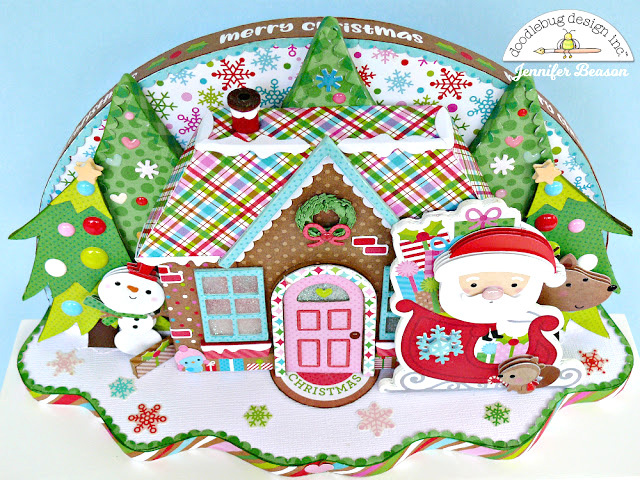 This project features the Christmas Town collection, that is so, so cute. 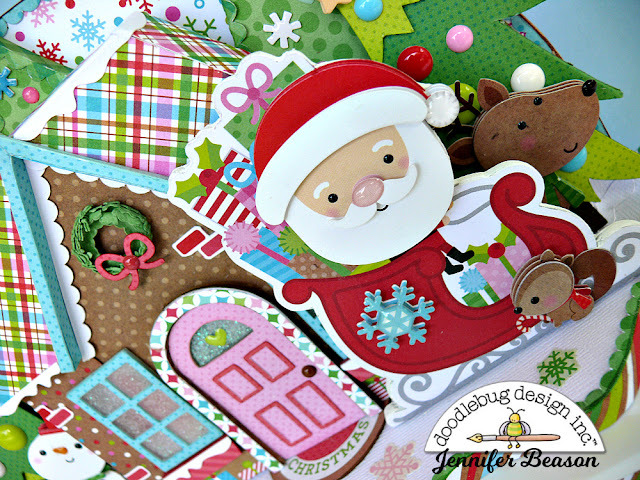 I especially love the Kraft paper addition to some of the papers. 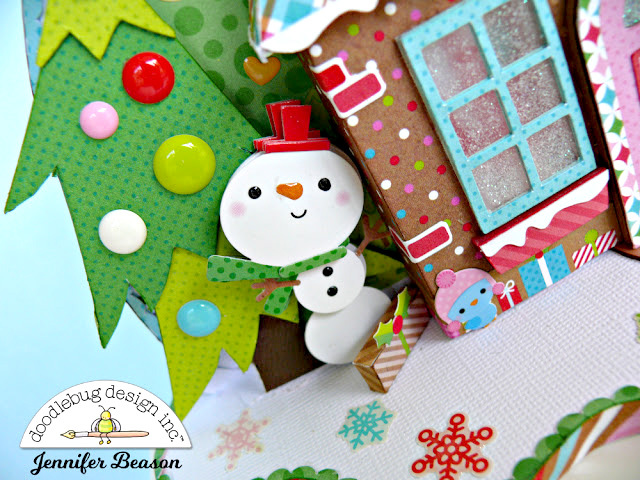 The paper color inspired the gingerbread styled house I created with the DB cutting file. The house was made from layers of foam board. 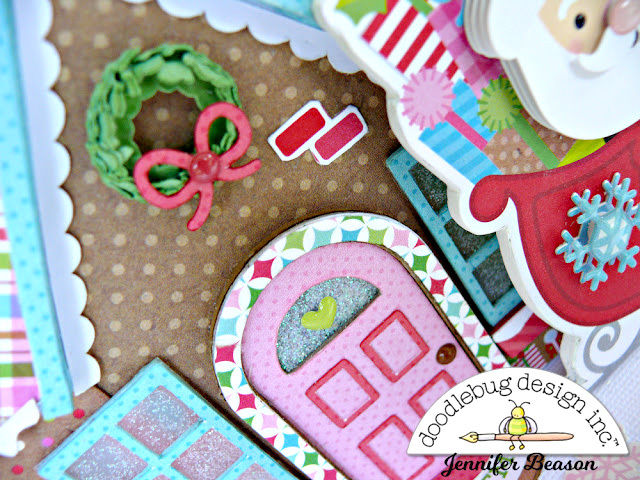 Chipboard was used for the details like the windows, door frame and door. 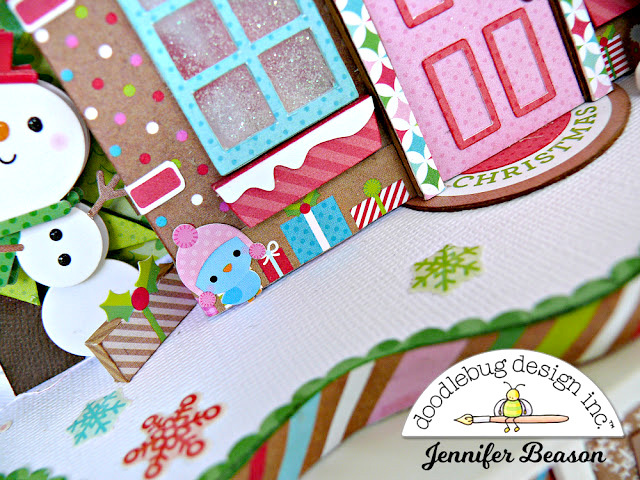 I added some simple shaped trees in the background and some colorful Christmas trees on either side of the house. 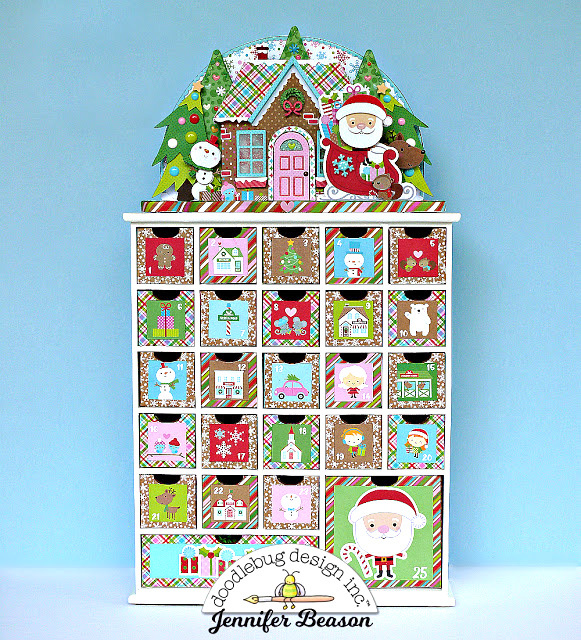 The frame that holds the advent boxes is a refurbished piece. It originally had small doors with magnets, but most of them were missing or broken. So I decided to remove all the doors, give the frame a fresh coat of paint and make chipboard boxes to fit inside each slot. Using the "Festive Flurry" page from the 6x6 paper pad and some coordinating papers from the collection, I was able to get most of the boxes done. 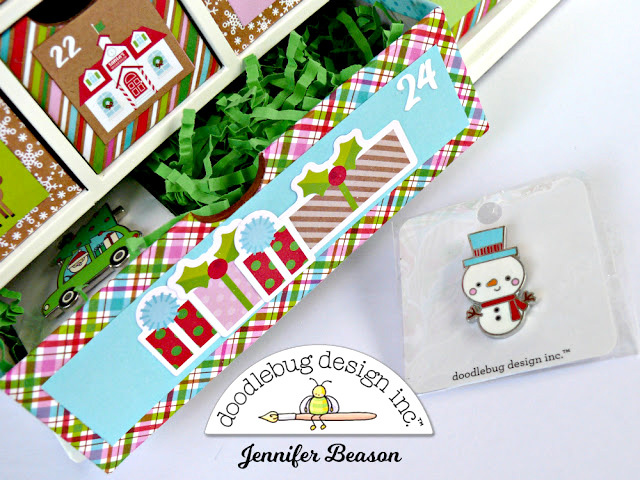 Since box 24 and 25 were larger I used some cardstock and a few die-cuts to complete the countdown. I simply adore the little blue bird sticker and found the perfect spot for her at the side of the house. 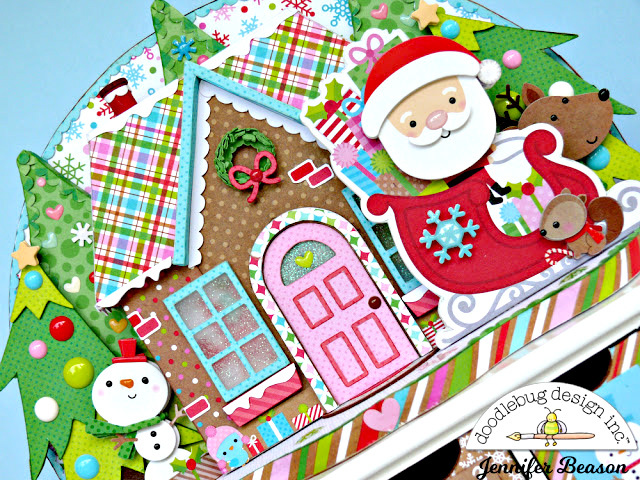 Both the round and snowflake sprinkles add more color, dimension and shine to the piece, which I love. To give the wreath a more realistic look, I cut it out 4 times. I then layered the pieces together and scrunched it up a little, before adding the bow. The Santa die-cut was mounted to chipboard then a few Doodlepop stickers were added for some more dimension. This is beyond amazing!!!! Every little detail is perfect!!! Is this a kit that's for sale? Wow! So much love poured into this that will be adored year after year. Pure perfection!